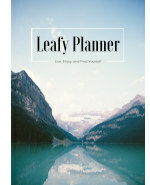 A few weeks ago, I launched my planner, the LEAFY planner. I love this planner because it’s beautiful and includes all the organization tools that I need as well as mindfulness and well-being practices. However, before I made this planner, I used notebooks as my daily organizers. I loved using notebooks because it is creative and customizable to whatever you might need. I was inspired by bullet journaling, but I tried to keep things simple and manageable. Here are the basic parts I always included. 1. Trackers: After deciding on my goals and priorities at the beginning of the year, I made some tracking grids that I used all year long. Those grids helped me stay accountable and on track. 2. Weekly spreads: I used this on a day-to-day basis to keep track of appointments and things to do. At first, I used an hourly to-do list to help me stay productive while working from home. When I got the beat of this, I then switched to a daily to-do list which was more flexible. 3. Creative space: I always made sure to keep some space to take notes, doodle, draft out posts or work on my projects. I liked having that room to be creative because it meant that I always could write down ideas or draw, even on the go. 4. Interior pockets: I love adding pockets onto the interior flaps of the notebook’s cover to put some business cards or important papers. This made the notebook a lot more practical. 5. Tabs: I used tabs to have the current week’s spread easily accessible. This also meant that I didn’t have to flip through the entire notebook when I needed to take an appointment or something. It also meant that other people didn’t have a look through my creative notes but only my weekly spread, which I liked. I really hope this was helpful to you. I really enjoyed using a notebook as I was able to create my own system and make it really practical and relevant to my own needs. I strongly encourage you to try it out and to create your own system! Yay! I started a Bujo this year too! Lots of fun and great way to stay organized! Very pretty! I keep a very similar bullet journal. 🙂 Not only does it help a great deal to stay orrganized (and cerative), it’s also a lot of fun!